The youth football season is under way and our first digest of the campaign features news of success for two Predators teams and one from Bognor. Get involved in the coverage by sending match reports and team pictures to steve.bone@chiobserver.co.uk - reports should ideally be no more than 150 words long, and pictures should be jpegs. We'll run regular round-ups on this website and in the Observer. 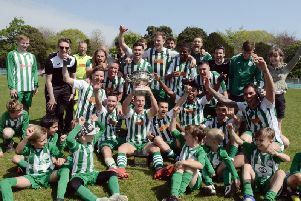 After the huge league and cup-winning success of Bognor’s under-14s last season, they opened up their new under-15 season in the Portsmouth Youth League A division. After conceding in the first two minutes, the boys refocused and took hold of the game. Manager Chris Hall said: “It’s fantastic after the success of last season to move into the Portsmouth League where boys will be tested further, it’s testament to them that the Portsmouth League put them straight into their top division. The mighty Tigers started very well and Kaiden Jackson hit the bar with an looping volley. Debutant goalkeeper Alfie Duffet made some fine saves and then Jackson was found with a brilliant pass and slotted in his first goal of the season. Luca Paris made it 2-0, arriving in the box to smash in the second for his first goal. Late on, Charlie Moore put through his own goal but this was a well-deserved win for the Preds. Predators: Duffett, Glithro, Yianni, Paris, Moore, Waller, Penfold, Jackson, Reading. Subs: Jennings, Wood. Predators: Lobato, Sneath, Jenkins, Booker, Baker, Hackett, Woods, Chadwick, Delani. Subs: Johnson, Niemic, Penkethman, Bradbury. Send your youth football reports and team pictures to steve.bone@chiobserver.co.uk for publication in the paper and on our website.